Studies show that men who request flexible work accommodations or family leave received lower raises and performance reviews, or risk being perceived to have negative traits often used to stigmatize women, like weakness and uncertainty. Last week should have been a great one for you guys—or at least those of you on the other side of the Atlantic. As of last Monday, British employers must plan to allow both parents to split up to a year of leave for any child born after May 31, 2015. The new law, estimated to affect some 285,000 couples at the outset, stipulates that each parent can take leave of up to 26 weeks, with 90% of pay for the first six weeks and a lower rate of pay for the remaining time. If desired, both parents can take their leave at the same time. In terms of equalizing skewed work/family opportunities, this change marks a victory for both working fathers and mothers as well as their children. 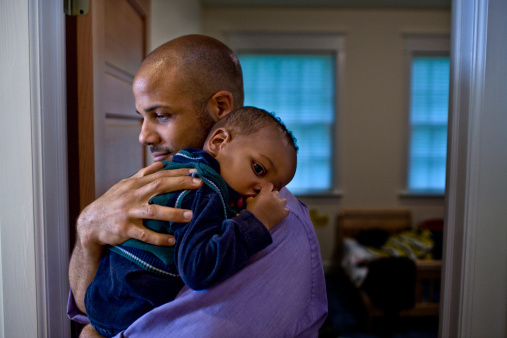 The policy helps alleviate some of the overwhelming pressure on fathers, 76% of whom report that they and their children don’t get enough time together, with 60% of them in dual-earner partnerships admitting that their work/family balance had caused conflict in their relationships. And right they are to assume that their children will benefit from having their dads around more, especially early on. Paternity leave is correlated with greater involvement by dads throughout their children’s development. Other research links paid parental leave for either parent to improved child health, and having fathers home for paternity leave can even increase children’s school performance in the long term. As for mothers, a 2010 paper by Elly-Ann Johansson of Sweden’s Institute for Labour Market Policy Evaluation, found that each month of parental leave that their spouses take increased the mother’s own future earnings by 6.7%. “When men are committing to do tag-team parenting…it’s very helpful for the women and also for the long-term wages of the family,” say University of Oregon academic Scott Coltrane, who studies the sociology of fatherhood. It’s a bit befuddling, then (not to mention depressing), that a policy change that should undoubtedly benefit British fathers and mothers alike, as well as their children, has been received with nothing less than consternation in much of the UK press. It should surprise no one that employers aren’t happy about it, as the new measure is estimated to cost them £17.1 million just in the first year. But more discouraging is the policy’s reception from dads themselves. “Most fathers ‘don’t want shared parental leave'” blared a Telegraph headline on December 1, the day the policy was inaugurated. The article recaps the findings of a Glassdoor poll where three-quarters of British men said they opposed sharing parental leave equally, and 42% said they would only take the minimum allowance of two weeks’ leave. Dismayed by these headlines, I posed this question to my partner, himself a professed aspiring equal-sharing dad. His answer reflected the findings of a great deal of research on this subject: New dads worry that companies will punish them if they opt to take their full paternity leave. In other words, new fathers are afraid they’ll suffer from the same career penalty that women have always faced upon becoming parents. Sadly, research unequivocally shows this to be the case. A recent New York Times piece offered an overview of the economic penalties equal-sharing dads face, with one study by Scott Coltrane finding that fathers who reduced their hours for family reasons saw an earnings reduction of 15.5% over their careers. In other words, my aspiring equal-sharing dads, the market (and probably also your employer) doesn’t give two fucks about gender equality, your work/life balance, or how much time you think you should be spending with your kids. So if you do—give two fucks, that is, and hope to be as involved in taking care of your children as their mothers are—please don’t expect it to be easy. In fact, your future earnings are likely to take a long-term haircut to the tune of 2.1% if you take just four weeks’ paternity leave. The rewards for you, your partner, and your kids are sure to be high. They just might not come in the form of money.